Hello everyone, I hope you are having a wonderful day. Today I thought I would share something different with you. As a book blog I write book reviews and other book related posts. Now, for me this was not always an easy thing. I still struggle from time to time, which is fine by me. When I started this blog or I should say when I really started to post on this blog was January 2017. At times point in time I never really wrote book reviews and I never really thought ahead with my posts. A little over a year later, I approach my writing a bit differently. That is not to say I am more rigid or I am not free to write whatever I want. In fact, how I approach writing has made it more fun and freeing. Now, when I started my blog the only reference I had was looking at other peoples blogs. I saw these awesome reviews and blog posts and the entire time I was reading them all I kept thinking was, “How do they remember all these details?” Thus, my journey to create my review/reading kit began. What is a review/reading kit? 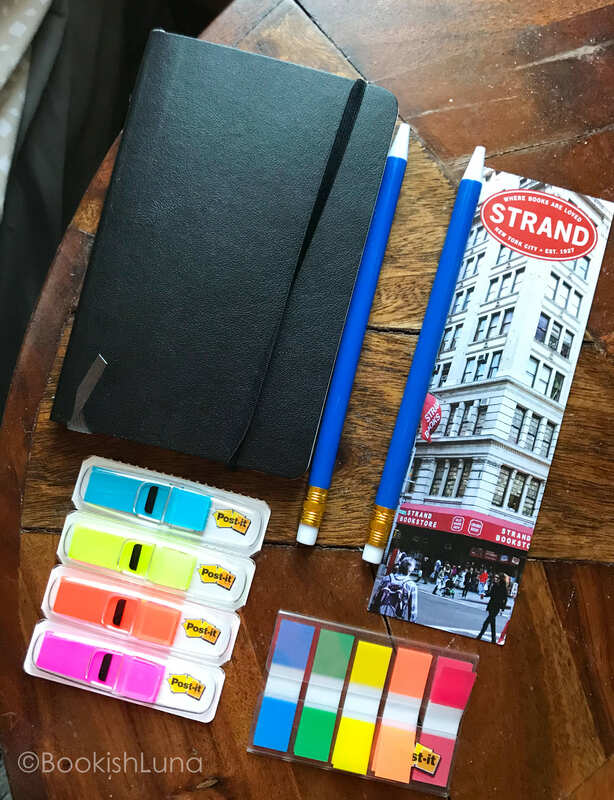 A review kit or reading kit is a small or big, depending on your preference, tools that help you keep track of your reading, ideas, and thoughts. This is highly personal and will vary from person to person. It could be digital or physical, maybe when a mixture of both. The important things is that it works with you and made the process of keeping track of your ideas and thoughts easier, not more cumbersome. What does my reading kit look like you ask, I’ll show you. This is the pouch I keep my reading kit in. It is small, durable, and lined so no water can get inside. I had a few reasons for picking this pouch. The first was because the size was perfect for what I needed, obviously this is the most important and practical reason. The second is because I liked how the zipper was on the smaller size, that way when I no doubt left it open there was less of a chance of escape by the things that I placed inside. The last reason is the aesthetic of it. I love the colors, they are soothing and remind me of the water. 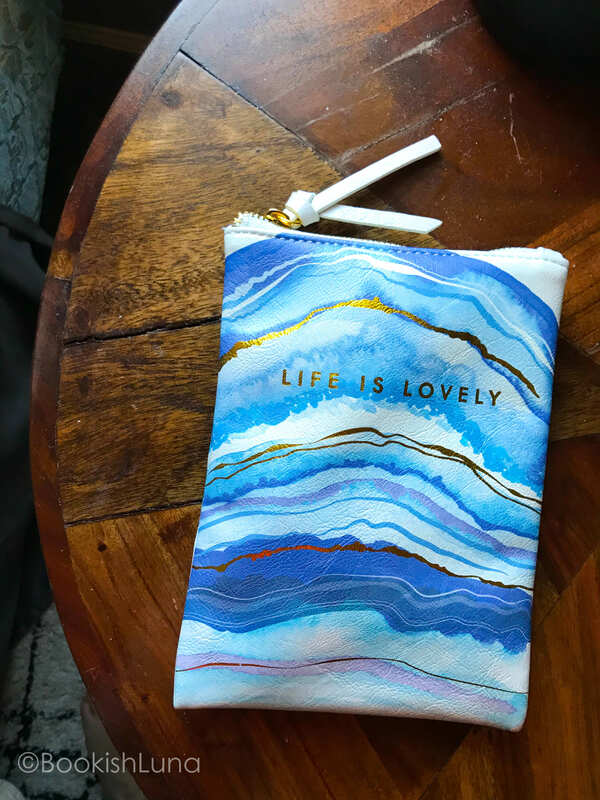 I also love the quote, it is a nice reminder “Life is Lovely”. Sometimes you just need to hear it from time to time. But Luna, what is actually inside? Let me show you! Inside I keep very little because I personally don’t need much. This is a year worth of me trial and error. Finding what worked and what didn’t. It is important to note what wha works for you will not work for you. But, if you need a starting point you may use mine as a reference. I have a habit of not grabbing a bookmark when I begin a new book, so I always keep one in my kit just incase. My mini notebook is the perfect size to fit into my pouch and it nice and light. I write a the title of a book on the top of two pages. Once side I write the positives and the other I write the negatives. I write a star next to random thoughts at the bottom of both pages. It almost ends up looking like a T chart with a free block at the bottom. The post-it tabs are used for various things. The first reason being if the book is a buddy read or a larger text I will tab my daily reading goals so I stay on track. The second reason is if I find a quote that inspires me or gets some type of reaction out of me I want to remember where it is. Even though my kit only has 4 items in it, it helps me greatly. If I am sitting at home reading I know everything I need is in one spot and if I am out and about it fits nicely into any bag I own. For me this has made reviewing more fun and LESS WORK. I used to dread writing reviews because I thought my brain would explode trying to remember everything. For me that is not an option. I need to keep track of my ideas and thoughts as I read. Now I am writing more reviews that I have ever and I am proud of that. It has given me confidence to try new things on my blog and go outside my comfort zone. Do you have a reading kit? How do you keep track of your ideas while reading books? Please do! I am glad you like the idea so much. Love this post. I have the same basic items that I use when reviewing a book, but I never thought of it as a “kit”. Glad you shared this with us! Also, that bag is so cute, where did you find a pouch this size?? Thanks so much for the lovely comment, I am glad you enjoyed reading my post. I picked up my pouch from a store called Paper Source, here is the link!